The health resort and sports city of Altenberg with its diverse neighbourhoods is situated in the scenic East Ore Mountains and offers a variety of great accommodations from holiday apartments to spa hotels. Altenberg is easy to reach, both with the Städtebahn through the picturesque Müglitz Valley and the steam-driven Weißeritztal Railway, which is now back in operation from Kurort Kipsdorf after a longer break. Recreational activities and adventures can be had year-round in Altenberg, providing the perfect combination of rejuvenation and relaxation for the entire family. Starting at Geisingberg, the Erzgebirge-Vogtland Kammweg (ridgeway) is one of the most popular quality hiking trails. Numerous well-signposted trails offer insight into the region’s mining history while passing through beautiful nature. Various guided tours offer visitors the chance, for example, to learn how regional herb liqueurs are made or to gain deeper knowledge about prominent buildings in the region. In the winter, Altenberg is one of the winter sports centres in the Ore Mountains. It has 70km of groomed cross-country tracks, six ski lifts and a double chairlift to reach the ski, toboggan and snowboarding slopes. Also of interest to visitors is going on a bob run on the local bobsleigh track, a biathlon with world champions, a torch-lit hike or snowmobiling. 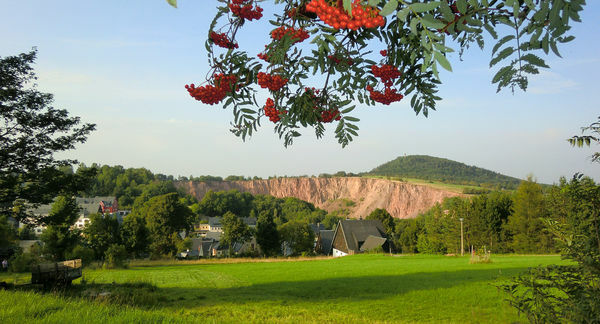 The region’s multifaceted mining history can be viewed in the Bergbaumuseum Altenberg (mining museum) or at the exhibition mine Vereinigt Zwitterfeld in Zinnwald. Im Winter gilt Altenberg als eines der Wintersportzentren im Erzgebirge. So laden 70 Kilometer präparierte Loipen, sechs Schlepplifte und eine Doppelsesselbahn zum Ski, Rodel- und Snowboardvergnügen ein. Doch auch eine Gästebobfahrt auf der Altenberger Bobbahn, Gästebiathlon mit Weltmeistern oder Fackelwanderungen oder eine Motorschlittenfahrt lassen keine lange Weile aufkommen. Die vielseitige Bergbaugeschichte der Region kann im Bergbaumuseum Altenberg oder im Besucherbergwerk Vereinigt Zwitterfeld in Zinnwald erlebt werden.